Here in Casco, Maine, we’re lucky enough to have two drive-in movie theatres close to us – one in Bridgton (two screens!!!) and one in Westbrook, Maine. Once the humidity of August is over and the nights are cooler, we love to hop in the car with the dogs, a couple of blankets and go watch a movie as the sun goes down. We’ll get sodas and popcorn at the concession stand but sometimes you want something a little more substantial and this is where the picnic pie comes in. I’m not sure you really need a recipe for a picnic pie, basically you just put your favorite fillings inside pastry in a muffin tin but here’s how I like to make my picnic pies. makes 9 perfect little picnic pies to enjoy out on the boat, in a drive-in movie theatre or at the beach! Preheat the oven to 350 degrees Fahrenheit. You’ll need a muffin tin, rolling pin, pastry brush and a couple of cookie cutters. Roll out your pie crusts (I like to roll them a little thinner than when you buy them). Using two cookie cutters you need to cut out 9 medium sized circles for your pie bases and 9 smaller circles for your pie tops. The exact sizes will depend on your muffin tin size. I found 5 and 3 inch cookie cutters worked well for me. Once you’ve cut out circles you can smush the offcuts of pastry together, re-roll them and use this to get more circles. 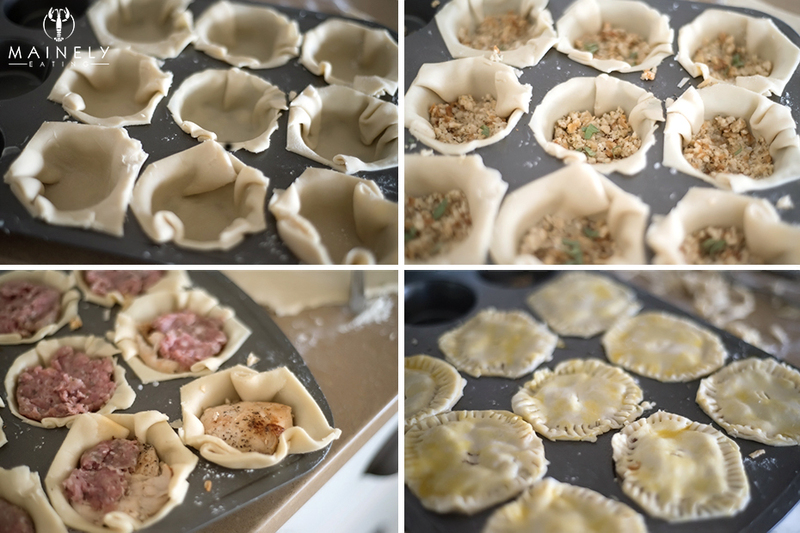 Line the greased muffin tin with the first 9 circles of pastry to make the pie bases. Trim the pastry so it’s not sticking to the next one but you don’t have to be too neat. Pop a spoon or two of the stuffing in the bottom of the pie so it comes 1/3 of the way up. If your stuffing contains meat, you’d want to make sure it’s cooked through. Slice the chicken breasts horizontally so you have 6 thinner pieces. Season with the salt and pepper and then saute them for a minute or two in a frying pan over a medium/high heat with a little olive oil. They don’t need to be cooked through (they’ll cook in the oven), you just want to get a little color on them. Place a piece of the chicken on top of the stuffing. You have 6 slices of chicken and you’re making 9 pies so you’ll cut the chicken to make enough for the 9 pies. 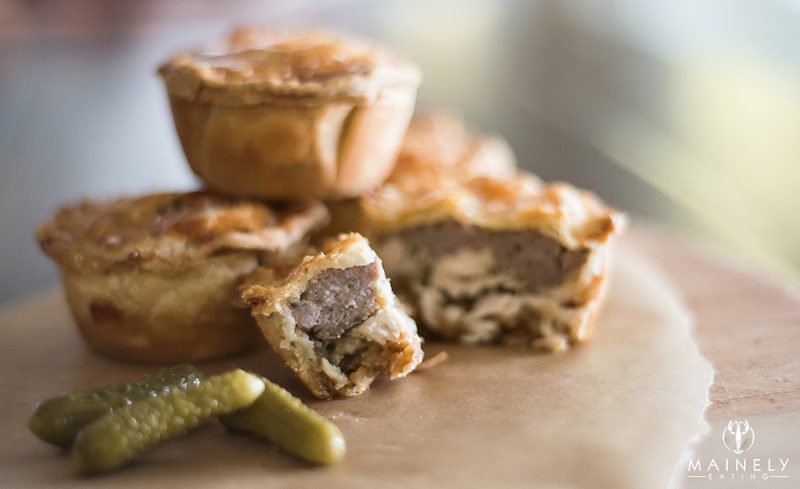 Top the chicken with your sausagemeat to complete the insides of your pie. The sausagement will cook through as it’s on the top of the pie and the fat/juices will run down during cooking to keep the chicken and stuffing nice and juicy. In a small bowl, whisk your egg to make the egg wash (kind of like a glue to stick your pie together). With a pastry brush (or a scrunched up piece of paper towel), moisten the edges of the pastry bottoms and then lay over your pastry tops. Carefully press the edges together and for added sealing you can also press down around the edge with the tines of a fork (plus it looks pretty). Use the tip of a sharp knife to cut two little vents in the top of each pie for steam to escape. Use the pastry brush to lightly paint the tops of the now-filled and sealed pies with the egg wash, this will make your pies lovely and glossy when they come out of the oven. Bake in the oven at 350 F for 45 minutes. If the tops look like they’re getting too brown throw a piece of aluminum foil over the top for the last 15 minutes. Once they’re cooked let them cool in the muffin tray for a good 15-30 minutes. Once you can comfortably hold them you can pop the pies out to cool on a rack. Delicious eaten while they’re warm or left to cool. Enjoy them with a little pickle or a crunchy cornichon. Store in the fridge if you’re not eating immediately. 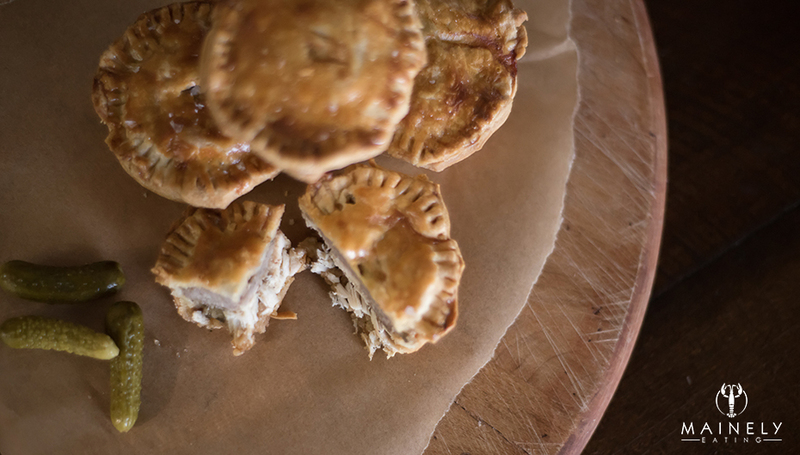 Variations: switch the chicken for turkey, add a spoon of cranberry sauce or relish and voila – Thanksgiving hand pies! Although this blog is called Mainely EATING, I also thoroughly enjoy drinking in Maine 😉 Champagne is my usual drink of choice but tonight it was a Pimms No1 Cup. Just the thought of a glass of Pimms transports me to a summer garden wedding or a day at the races or watching the tennis at Wimbledon. The refreshing cucumber, the cooling mint, a hint of apple and the glass slowly sweating in the heat…. If you’re not familiar with the history of this delicious drink then the short version is that this fruit cup/liqueur hybrid was invented by Pimm, a farmers son from Kent in the UK back in the 1800s. It was sold as a “tonic” that aids digestion of all things. The base spirit is gin but I think it’s barely noticeable, you’re more likely to enjoy a hint of burnt orange and maybe a little spice. It feels like we’re in the last few days of summer so I thought we’d have a little “tonic” outside tonight. 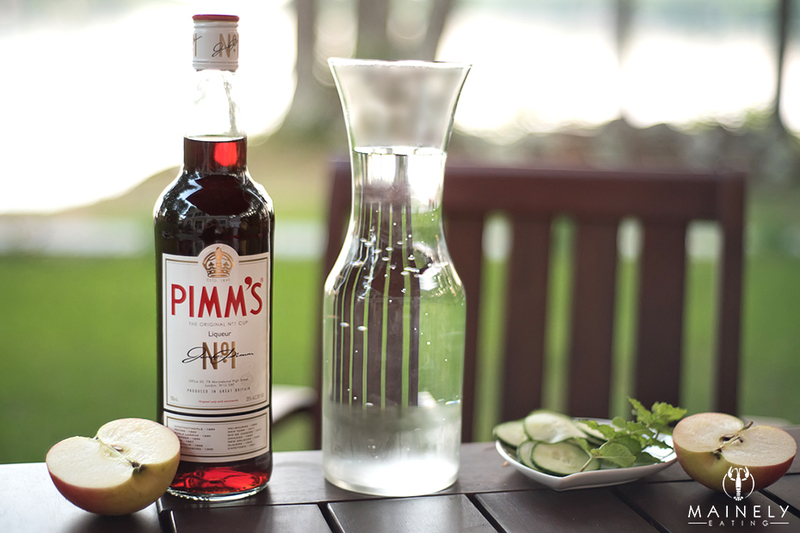 There are many ways to put together the perfect glass of Pimms, I like mine with a lemon/lime soda (diet 7up works well if you don’t want too much sugar or you can try ginger ale or even lemon/lime sparkling water for a lighter taste), ice, thinly sliced cucumber, a little apple and a sprig of fresh mint. I almost feel I should put on a fancy dress and hat before taking that first sip! 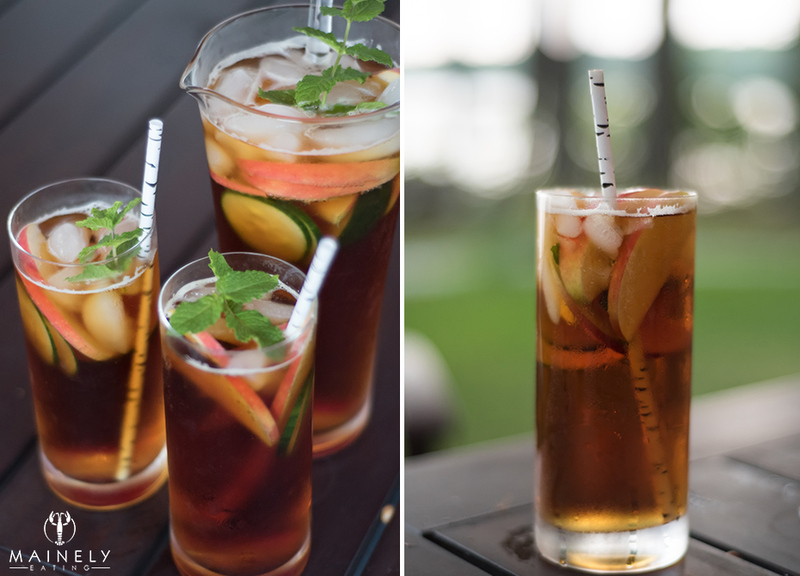 Also try: Mix your Pimms with champagne for a “Royal Pimms Cup” or with warm apple juice for a “Winter Pimms Cup”!